It is a privilege to view an artist’s sketchbook or works on paper for it is almost like getting a chance to see the world through the artist’s eyes for a moment. Sometimes it gives you a glimpse of how paintings that we have come to call brilliant first got their start as mere ideas represented by scribbles or marks on a page. On the contrary, sometimes drawings in sketchbooks are exquisitely detailed or beautifully rendered works, and are little masterpieces themselves such as the works by Datuk Ibrahim Hussein. They say that the eyes are the window to the soul; in that case, the works on paper by this esteemed artist act as a window to his soul. A sketchbook, or works on paper is the place for an artist to record ideas, memories, and observations. Leonardo da Vinci’s sketchbooks are the most well-known, with many books published on his extensive drawings, diagrams and notes. Even the legendary Malaysian artist, Khalil Ibrahim too had small sketches of his favourite subject, the East Coast. 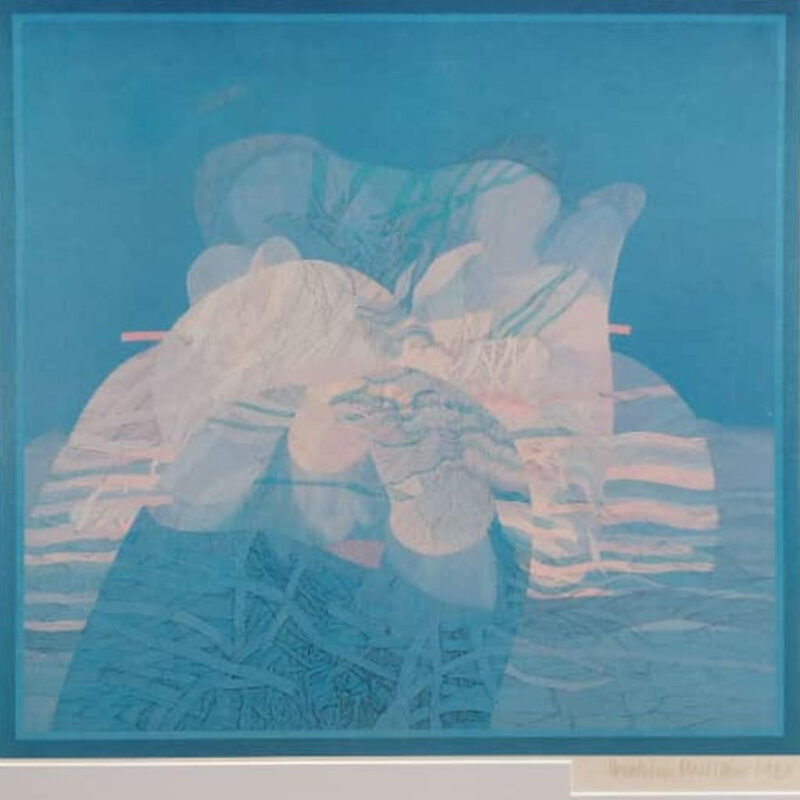 Hence, it does not come as a surprise that Ibrahim Hussein, a brilliant artist himself, would have meticulous works on paper such as the ‘Movement in Blue’ (1983). It’s fascinating to see his drawings and paintings on paper representing his thoughts, observations and it’s even more fascinating to witness the draft and later, the fruition of it all. Ibrahim never failed to captivate art enthusiasts by proving his mastery in abstract, which is often deemed futuristic due to the complexity in the way he expressed the forms anddimensions of his creation. His works on paper do not lack the vigour that his canvases possess, in fact, it’s hard to distinct between his paper and canvas works. His bold use of colours and extravagant brush strokes is widely known to art followers with an identity of its own. Ibrahim’s renowned works, such as the ‘Man with Possessions’ and ‘The study of Man with Possessions’, 1964 reveal his process in crafting a masterpiece began with ‘a study’, where his vision was laid out as precise as the final work. It’s fascinating how Ibrahim made all his works an extension of himself, packed with dynamism and life. It was through the 1960’s and 1980’s, during his time in the UK that Ibrahim proficiently produced many of his works on paper, gouaches to be precise, that were later displayed in his one-man exhibitions in the UK as well as US.